By March, regional impacts of large-scale climate patterns normalized, and air temperatures, precipitation, and coastal downwelling were below normal. April brought abundant rain and rivers responded. With La Niña returning to ENSO-neutral conditions, will the favorable snowpack maintain beneficial streamflows through summer? In 2018, water conditions in Puget Sound are mostly expected, except in Hood Canal where conditions only changed recently. Many rivers and field drainage ditches release sediment. 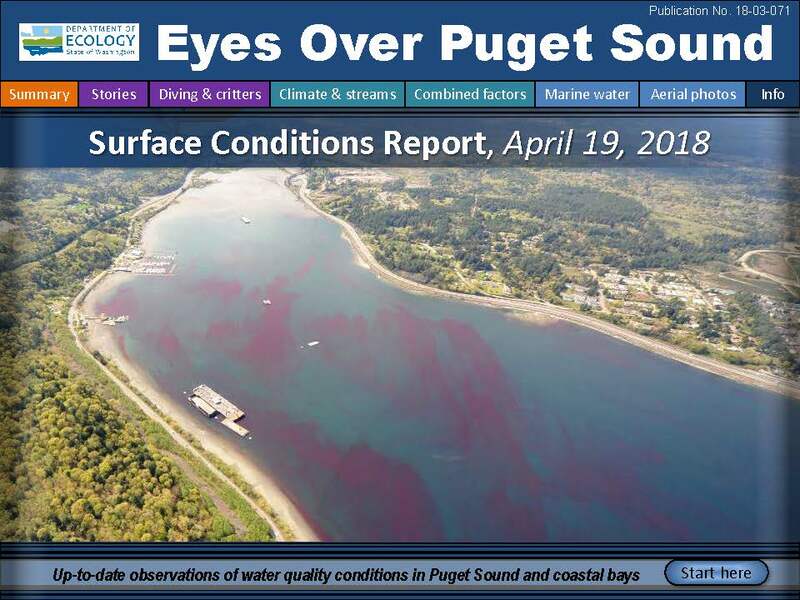 A strong red-brown bloom is present in Sinclair Inlet, a bright- brown bloom in Padilla Bay (Joe Leary Slough), and a bright green bloom in Bellingham Bay. It is colorful out there! You might see our team on the water sampling sediments this month. Description By March, regional impacts of large-scale climate patterns normalized, and air temperatures, precipitation, and coastal downwelling were below normal. April brought abundant rain and rivers responded. With La Niña returning to ENSO-neutral conditions, will the favorable snowpack maintain beneficial streamflows through summer? In 2018, water conditions in Puget Sound are mostly expected, except in Hood Canal where conditions only changed recently. Many rivers and field drainage ditches release sediment. A strong red-brown bloom is present in Sinclair Inlet, a bright- brown bloom in Padilla Bay (Joe Leary Slough), and a bright green bloom in Bellingham Bay. It is colorful out there! You might see our team on the water sampling sediments this month.